How are roofs damaged by hail ? This is a question many homeowners have. After all, roofs are designed to be sturdy and to withstand the elements. How is it possible that something like little frozen ice pellets can wreak such havoc? Perhaps you just endured a hail storm or want to take a proactive approach in preparation for the next stormy season. Either way, you have good questions. The sound of hail pellets on the roof is enough to bring tears to many homeowners’ eyes. While you can’t prevent a hail storm or damage to your roof, you can get the necessary roof repair to ensure your home is as safe as possible in the days and months to come. Roof damage from hail can sometimes appear minor to the eye, but the true damage can be more severe. During a hail storm, the primary factors influencing the severity of roof damage include wind, size and density of the hailstones, the building materials of your roof, and the positioning of neighboring homes and barriers such as trees and other structures. Hail can be the size of a pea or as large as a golf ball or softball; obviously size plays a significant role in the level of damage. Stones may also have rough edges that can puncture the roof. 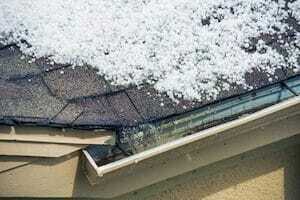 If your roof is older or is already in a damaged state, it is even more susceptible to injury from the hail. It’s important to get a thorough inspection from a roofing expert as soon as possible following a storm. A professional roofing inspection will ensure you identify any underlying damage you may not catch with the eye. The right roofing expert will be able to find out exactly what is going on with your roof—this is important for a proper repair and also for filing any insurance claims. The right roofing expert will provide you with a thorough list of the roof’s damages and a comprehensive repair plan. Keep in mind you can always obtain additional quotes from other roofing companies to ensure you are getting an accurate quote that meets your needs and budget. You’ll find there are many roofing companies in the Atlanta area that can provide you with a quote for hail damage repair. The key is finding the company that will provide the customer service and expertise you need to get the job done right the first time. At Hopewell Roofing and Restoration, we have developed a loyal following of residential and commercial customers who trust us with their roofing repairs. Our roofers have seen their fair share of hail damage and know exactly how to identify problems and deliver lasting solutions. We pair our expert roof repair with attentive customer service that exceeds expectations and the highest quality roofing materials available. We work quickly and efficiently and are only satisfied with the job when we get the thumbs up from our customers. 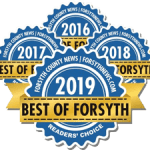 It’s this commitment to excellence that has made us the preferred choice for roof repair in the Greater Atlanta Area for nearly a decade. You’ll notice the Hopewell difference from the first call you make to our office, and we’ll be with you every step of the way until you have a professionally repaired roof over your head. Our team of roofing experts is licensed and qualified to perform your roof repair no matter how minor or severe the damage. A strong, secure, healthy roof is essential to keep your home and family safe, so you will want to avoid cutting corners with your repair. At Hopewell Roofing and Restoration, you can trust you are getting the best roof repair, roofing materials and customer service in the area. Call 678.771.5372 to speak to one of our friendly team members. We are happy to answer your question, “how are roofs damaged by hail”? And we’ll be there with the answers and service you need to ensure your 100% satisfaction. Contact us now to learn how are roofs damaged by hail and for your free roofing estimate.